Laser dentistry is a growing field which has many promising implications for the practice of oral health care. 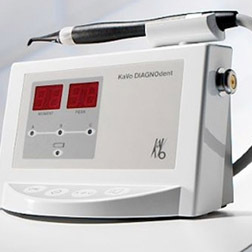 Although many laser-based technologies are designed to correct dental issues, some are being used for preventive measures. 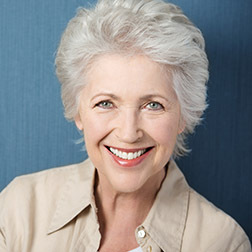 One such method commonly used at Adult Dentistry of Ballantyne is laser cavity detection. Despite tremendous advances in the field of dental care, cavities are here to stay and they affect countless patients, even those who give the utmost attention to their daily oral hygiene. Fortunately, laser technology offers a new technique for identifying cavities before they start causing pain or discomfort. Laser Cavity Detection can identify cavities long before they begin to cause pain or discomfort. The specialized laser finds soft spots in the teeth and measures their depth as they form. Subsequent measurements reveal when treatment is necessary. Catching cavities at their earliest allows patients to take action to slow the deterioration. Early cavity detection helps Adult Dentistry save more of the tooth, which is the ideal. When cavities are discovered early, fillings can be up to 70 percent smaller. Our laser cavity detection process is entirely painless and state-of-the-art. Cavities are formed when bacteria erode enamel, softening it during each progressive step until a cavity is formed. Using a sophisticated laser, Dr. Robert Harrell can identify soft spots in your teeth and take a measurement of their depth. This information provides a detailed description of how advanced tooth decay has become and whether or not restorative treatment is needed. During each visit, Dr. Harrell can take measurements of your trouble spots and determine when and if it is necessary to treat the cavity. There are several advantages to using laser cavity detection. First, because the formation of cavities can be identified early, Dr. Harrell can provide detailed instruction on ways to slow the formation of a cavity. In addition, laser detection makes it easier to pinpoint and treat cavities before they become painful. Perhaps best of all, the early identification made possible by laser cavity detection results in smaller fillings. 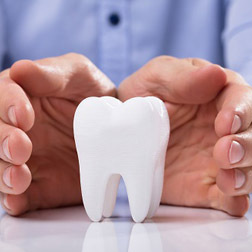 Needless to say, preserving natural tooth material is a top priority, and when cavities are detected early, fillings can be up to 70 percent smaller. Teeth are at the mercy of many environmental factors, the biggest of which is our diet. Sugars and acids are the primary catalysts behind tooth decay, as they provide suitable surfaces for plaque to attach and grow. That being the case, it is essential to brush your teeth thoroughly at least twice a day. Furthermore, you can negate the effects of sugary or acidic foods by simply rinsing your mouth with water or mouthwash after each meal. The longer these substances have contact with enamel, the more damage they are able to inflict. By rinsing after meals, you can greatly reduce the amount of damaging compounds that lie dormant on your teeth. Flossing, of course, is another mainstay of good oral hygiene. It is best to do this at least once a day, as it helps remove plaque from areas that your toothbrush and mouthwash cannot reach. Periodic teeth cleaning also goes a long way in keeping your smile bright and healthy. The hygienists at Adult Dentistry of Ballantyne can provide a comprehensive cleaning that will protect your teeth and leave your mouth feeling fresh. Even if you practice good oral hygiene, it’s extremely beneficial to have Dr. Harrell monitoring your teeth and identifying potential cavities before they become troublesome. Don’t wait until cavities have compromised the quality of your smile. Set an appointment today.